How to Configure and Deploy a Cowrie ssh Honeypot for Beginners. Cowrie is a medium interaction honeypot written by Michel Oosterhof that is designed to not only log bruteforce attempts against an ssh server, but to “record” the entire shell session of an attacker. It creates a “fake” server that will be used to lure attackers to attempt access. The functionality of Cowrie extends far beyond what is described here, and will be the subject of future blog posts. I encourage you to visit the Cowrie repository on Github in the meantime to read about all that it can do. 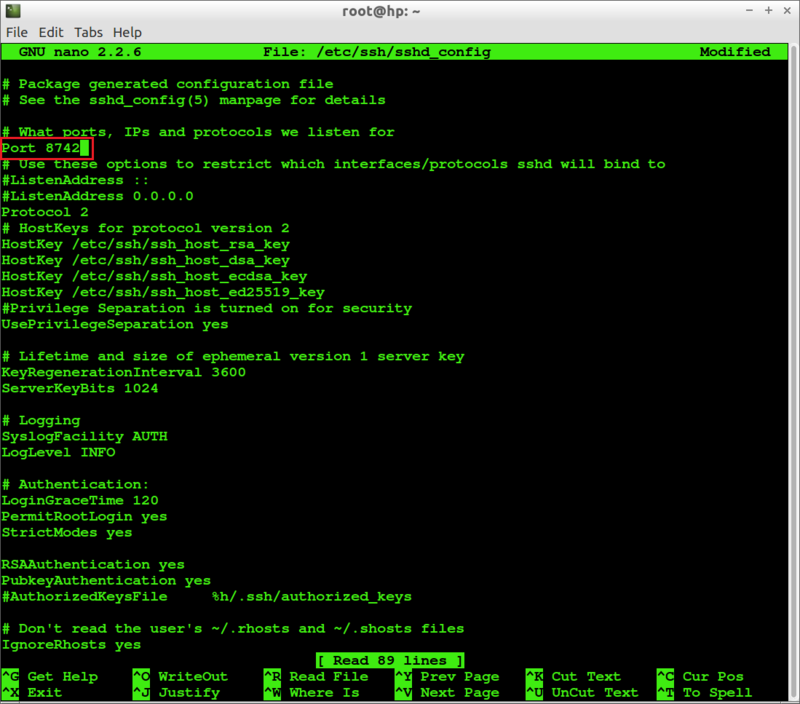 This post is intended to describe the steps to configure and deploy a Cowrie base install. 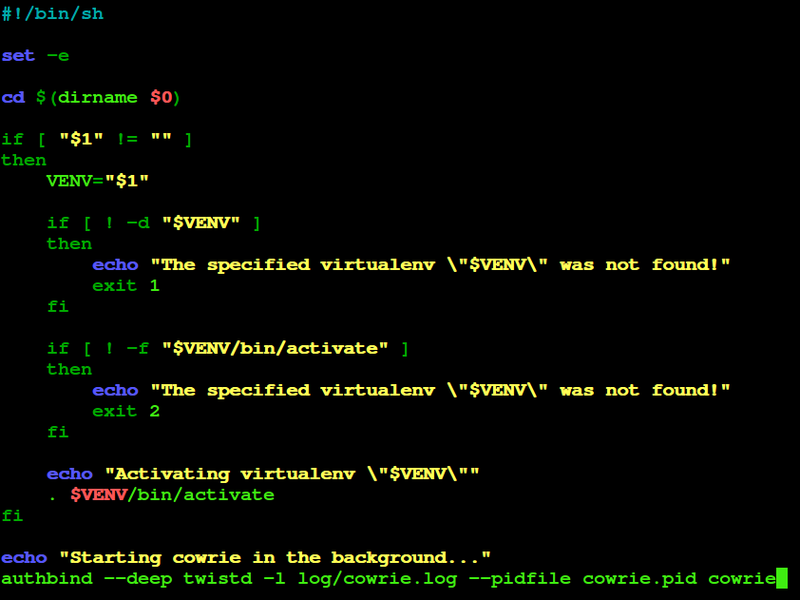 Is this the only way to configure and deploy Cowrie? No. Have the steps below been tested on a live server? Yes. Have I missed anything? Maybe. For the purposes of this post, Cowrie was installed on an Ubuntu 14.04 768MB Vultr VPS (affiliate link, I earn account credit) and it assumes that you are familiar with the basic idea of what a honeypot is. It begins with you connected via ssh to a fresh VPS instance with your hostname configured. I’ll use nano as my text editor. If you prefer vi, emacs, gedit etc., knock yourself out. And before you ask: Yes. You can run a honeypot from home, but that can get complicated and I’m not going to show you how to do it. 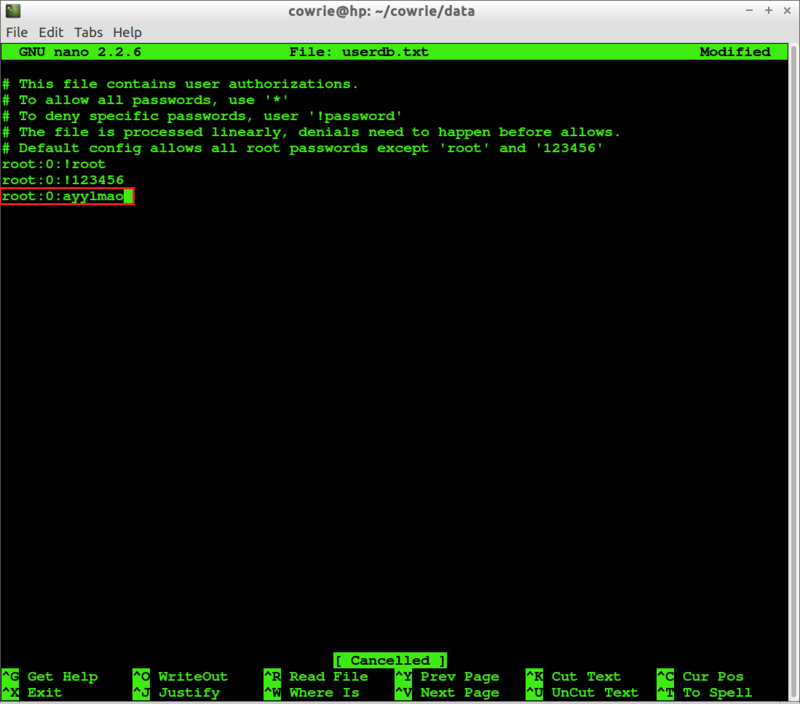 Cowrie cannot be run as root, so we’ll add a non root user (user “cowrie” in this example), and give the user a password. The rest of the user information can be left blank. We’re now in the home directory of user “cowrie” where we’ll install the honeypot. Enter the following command to pull the code out of the Github repository and create a new directory called cowrie that we’ll use to configure and start the honeypot. Let’s move into the newly created cowrie directory and begin to configure the honeypot. 1) We need to uncomment and change the line that defines on which port Cowrie will listen. Navigate to the line that reads “#listen_port = 2222” and change it to “listen_port = 22” as we will soon fully configure Cowrie to listen for attacks on this port. Cowrie allows us to create a “fake” file system using Python pickle that the attacker will interact with upon successful entry into the server. We’ll enter the/cowrie/utils directory and use createfs.py. Read the top comment section on how to deny specific passwords by using “!” and how to allow any password with a given username by using “*”. We’ll add a password to the list as shown below, then save and exit the file. 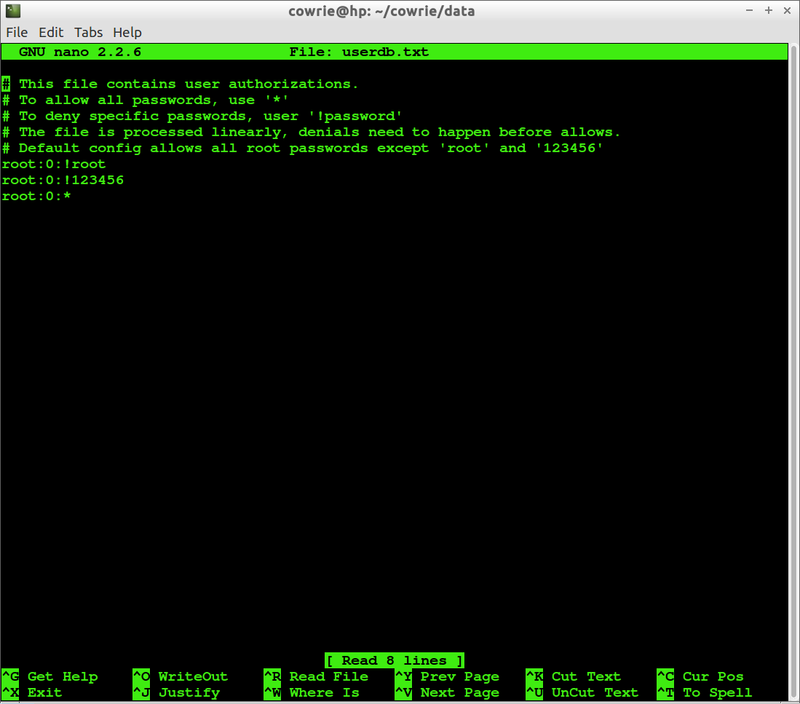 You’ll be prompted for a password, enter anything besides a password on your list in userdb.txt. We’re going to ensure that Cowrie is logging attempts to enter our server. After a few attempts, you’ll be disconnected from the server. We’ll now log back in to our server as user cowrie using the admin port that we configured in the beginning steps…in this case we used port 8742. The result should appear as below. The attackers IP will appear in the blacked out area of the file, and we should see the failed username/password combinations that we just entered in the area within the red boxes. That’s it. We’ve installed and configured our Cowrie instance, ensured that it is running properly, and confirmed that it is logging attempts to bruteforce our ssh server. You may start logging attacks soon after deployment, though sometimes it takes a while. Most of your attackers will be bots. Generally speaking, the longer Cowrie is deployed, the more it will be attacked. I have several instances of Cowrie deployed and it is not uncommon to log several thousand bruteforce attempts per day. As I mentioned above, Cowrie is capable of much more functionality like supporting JSON logging, logging of direct tcp connection attempts and SFTP and SCP file upload. Thanks for reading, and if you have any questions or if there’s anything I missed, find me on Twitter.